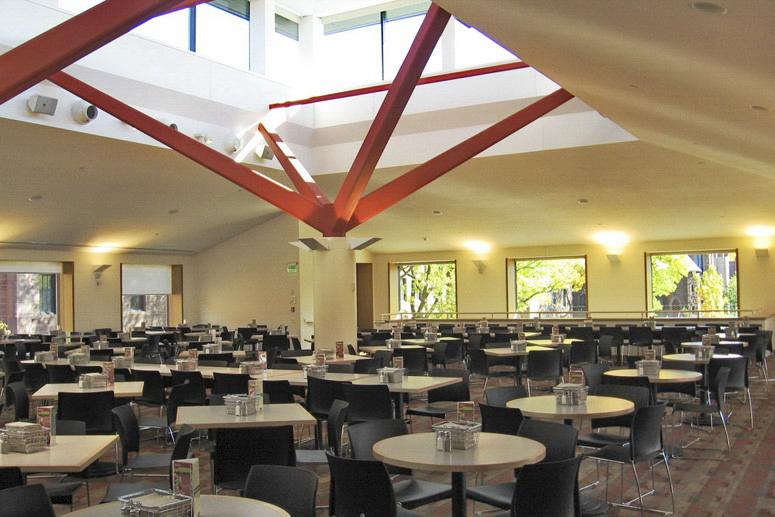 If you’ve been to the dining hall, you’ve probably noticed that Usdan (pronounced yooz-dan) University Center is divided into two wings: the “loud side” and the “quiet side.” The loud side plays music over loudspeakers (anything from “Despacito” to “Gangnam Style”) and tends to have longer, larger groups of tables. The convivial atmosphere and banquet-style tables make the West Wing ideal for sports teams, whereas the “quiet side” has smaller, singular tables and no background music which makes it ideal for people catching a quick bite while working. There’s no hard and fast rule about where to sit in Usdan, but these key, seemingly insignificant differences have bred an apparent cultural divide at the University. Humanities-focused, “artsier” kids tend to gravitate towards the quiet side, a home to music kids, film majors, studio art buffs, and everything adjacent. Ironically, the same students that religiously frequent concerts on the weekends have no interest in listening to music during their meal times. The loud side, on the other hand, has a hardened sporty reputation, more frequented by STEM majors and NARPs (Non-Athletic Regular Persons), who may not play sports but still enjoy the social and spectator scene. Some students swear by the distinction, actively avoiding either side even as free tables and chairs become scarce. Others, we’ll call them “Troy Boltons,” are happy to flip from one side to another. The physical divide between two major groups at the University may make you feel like you have to choose, but plenty of students find a home on both sides of the aisle. Johnny Hayes ’20 plays on the University’s squash team while also an active participant in the student theater community. Logistically, it can be difficult (sometimes impossible) to fit in rehearsals and practices in the same schedule, but Hayes has juggled both of his quiet and loud side sensibilities. Through perhaps an “out of sight, out of mind,” mentality, the two sides of the cafeteria have created attitudes that extend to every aspect of campus: extracurriculars, areas of study, and social circles. Because many freshmen first experience social life at Wes in the dining hall, the habit can be hard to break. The University boasts significant alumni in both the performing arts and athletics (our gym’s foyer is called Belichick Plaza, and one lucky freshman wins the Hamilton Award every year), but these aspects of the school’s identity rarely overlap. It’s true that with the time commitment that both sports and the arts demand, students simply don’t have the time to explore multiple arenas. Spending your time on one side doesn’t mean that you can’t make the switch later in your college career. Jewelia Ferguson ’20 entered the University as a member of the basketball team before a shoulder injury rendered her unable to play. Her introduction to Wes came through the lens of the loud side, but increasingly she found more kinship with the music scene. It’s not apparent when freshmen clue in that they “should” be sitting on one side of the dining hall or another. Often during orientation, students sit indiscriminately, without any upperclassmen to tell or show them otherwise. Slowly, they take on a preference that solidifies into routine. Tribalism is hardly a novel concept in college life. Even in the absence of traditional Greek life, students are constantly searching for a group to belong to or a sense of identity, whether it be with the slam poetry club, the lacrosse team, or a specific corner of the cafeteria. Freshmen—no offense—are especially susceptible to the herd mentality, spending a majority of orientation finding security in numbers. If one freshman class chose to ignore the cultural and social implications of Usdan’s two sides, perhaps this divide would disappear in four years. Maybe the arts vs. sports rivalry exists intangibly, and the dining hall is only a reflection of what we already know and act upon.